Our Daughter’s Prayer, Part 3 | Lift Jesus' Cross! Posted on February 5, 2015	by Lift the Cross of Jesus! Doi and Li, our Burmese foster daughters, were so exhausted after their arrival. The trip to America meant leaving all that they had previously known. Months earlier, both girls courageously escaped from Burma under extremely dangerous circumstances. One lay at the bottom of a boat as a guide secretly crossed the river at night to freedom. The other was separated from her sister and stuffed into the trunk of a taxi where she lay for hours in the dark, alone and afraid. No, I’m not making this up. They had been traumatized. While in Burma, one was beaten in a prison, the other kidnapped by Burmese militia and forced to carry weapons as a child. I was so glad that they understood phonetic sounds for most of our letters! Class over, we relaxed and I showed them books. One of the first things we did was enroll them into a summer ESL school. After that, I found a child’s dictionary that contained pictures of words with spelling beside each picture. Li poured over her dictionary, quite the student! Doi was much more interested in the garden. I took Doi to Lowe’s to look at the end of spring flowers and vegetables. She walked right passed every green plant and went straight to the cilantro, rosemary, garlic, parsley, and onions. We bought some of all the herbs she wanted. Later on, I found out that girl knew what to DO with all those herbs! She was quite the cook! You can imagine my surprise when, during her first year away from home, she sent me a check for $100 in November. “Mom, buy big Thanksgiving meal.” Wow! Maybe she missed my cooking, too? Scott and I got involved in fostering children from overseas because we both have a great HOPE that one day the starving, orphaned children of North Korea may also be free. And when they are freed, we wanted to be here waiting, fully understanding the foster care system provided by the UNHCR (United Nations High Commission for Refugees) coupled with the LIRS (Lutheran Immigration Refugee Service). We learned a ton–but I won’t get into all that now. I will say that the 4th of July holiday was coming within a week after the girls’ arrival. I wasn’t sure I could communicate clearly what the holiday was about, but I was determined to try. I pulled one of children’s history books off the homeschool shelf and opened it. Li had her English to Burmese dictionary in hand and looked up a few of the words within the quotes to fully comprehend the meaning. I shivered. Straight from the mouth of a fifteen year old who knew what it was to live without freedom. I believe that this first small history lesson confirmed for Li that she had made the right decision to leave her country and come to America. 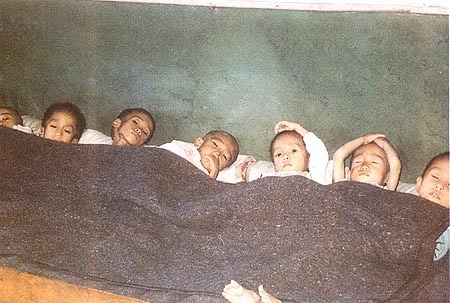 Today, Doi and Li’s Burmese Christian family are suffering more than ever. I hope that Doi’s next text message will help us comprehend her plea for help and each of us will hear Holy Spirit’s voice telling us how and what to pray. “Yesterday the Burmese Army burned four young men. I don’t want to include a picture to you this time because this is very bad. We suffer so much. Kachin, Chin, and Karen–we all need to be one team now. Bad spirits are destroying our religion and peoples. I announced to all our neighbors and churches to help us to pray, too. On Saturday, February 7th, 2015, join Doi and her American mom in praying for Burmese Christians. Doi is Kachin. Li is Chin. The Karen people group are also under great persecution. Thank you for praying! 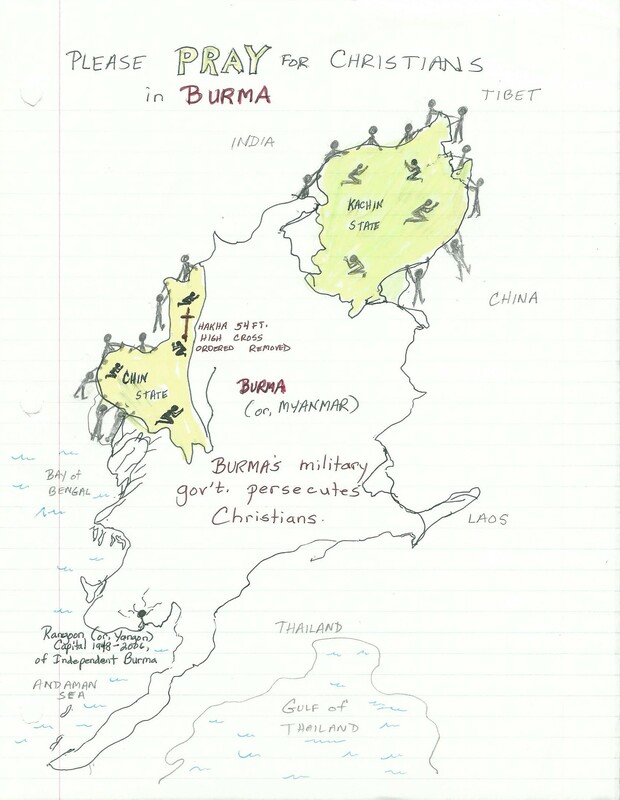 This entry was posted in The Cross of the Martyrs and tagged Burma, Burmese military, Burmese militia, Chin people, Chin State, Christian persecution, Kachin, Kachin State, Karen people, martyr, martyrs for Christ, Myanmar, persecuted Christian Karen. Bookmark the permalink. It’s my sincere belief that we need to “remember the prisoners as though in prison with them” so that when we Americans are going through horrendous times in the future, the Lord will direct believers throughout the world to remember us. Yes, I’m thankful for His never-ending grace, but still, judgment is without mercy to the ones who have shown no mercy. So, let us show mercy now by praying for the persecuted church in other nations. Well said, Larry. I couldn’t have said this better, really. And I can’t explain that with the positive, upbeat blogs that I’ve written here, our Burmese daughters feel this sorrow daily. Why? Because the Burmese are FAMILY to them. Christian family or biological family? Both. I’ve written in more detail here hoping that some who read this blog will feel like Doi and Li are more FAMILY, too. It can be difficult to identify with people through news reports, right? So I tried this week to introduce all of us to the faces of the people in Burma. One day in heaven, God will point to that bowl of prayers in heaven and show us ALL THE POWER that he was happy to unleash through our prayers. Anyway . . . you got me going here. Haha! Yes, I’ll be praying too. God bless you, Donna, for joining us. I will be praying friend! 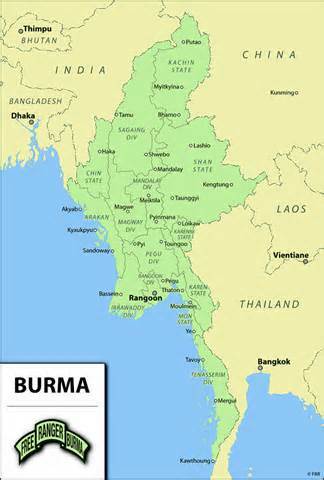 I pray Ps.91 over our dear Burmese brothers and sisters and that His mercy come and surround them.